Hello! 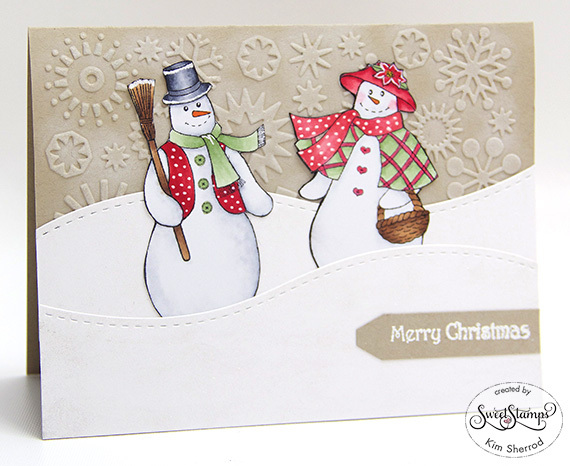 Kim here to share with you a Christmas in July card using Mr. and Mrs. Snow Duo. I created the scene using a snowflake embossing folder and die cut the snow. The snow couple was colored in using Copic markers and I added snow and polka dots to them using a white gel pen. I also added glitter to the snow. Be sure to check out our current challenge and enter to win a prize from the store. So beautiful! I can wait for snow - heheheh - but your card is adorable! This is so cute, love the embossed background and the snow hills. Beautiful coloring on Mr and Mrs Snow.